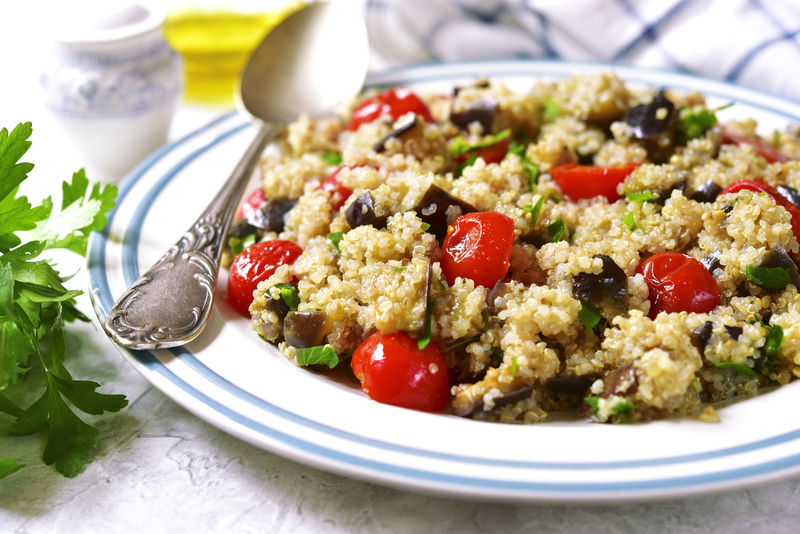 My family enjoys this healthy quinoa salad throughout the spring and summer months. Combine this salad with some grilled vegetables and a lean grilled meat of your choice (salmon, 93% ground beef or better, chicken or pork loin). You and your family will not only enjoy a delicious meal, but also one that is well balanced! Combine water and quinoa together in pot. Turn heat on high and wait for mixture to come to a boil. After it has come to a boil, turn down the heat to medium-low and cover for 15 minutes. Take off heat source and add into a boil so that it can cool. Combine oil, lime juice, cumin, salt and red pepper flakes into a boil and whisk together. Combine remaining ingredients (Quinoa, tomatoes, black beans, green onions, cilantro) to oil mixture and mix together. Ideally chill for a several hours, however can be served immediately or slightly chilled. My girlfriend made this for me. It was awesome. Thanks for sharing it!! !